As of the beginning of the year all hand-held devices are banned while driving in the state of Illinois, which means no talking, texting or emailing while driving. 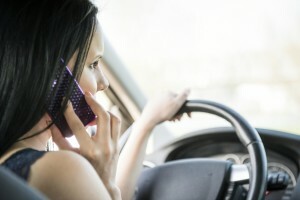 You can use a phone if you are using a speakerphone or headset in most circumstances: when in school zones, during constructions zones or if you are a novice driver (driver under the age of 19) even hands-free technologies are prohibited. Prior to 2014 local municipalities enacted their own laws, which led to confusion regarding what was allowed where, so this statewide ban will simplify Illinois cell phone laws into one uniform law. When reporting an emergency situation and any continued communication with the emergency personnel for the duration of the emergency. If you are using hands-free or voice-activated technology. The vehicle is parked on the shoulder of the road. If the car is stopped and is either in neutral or park when traffic is obstructed, such as a traffic jam. Police and emergency vehicles are exempt from Illinois cell phone laws when on duty. As in most states Illinois Cell Phone Laws are primary laws, which mean the police can pull you over just for using your cell phone while driving. Fines for violating Illinois Cell Phone Laws start at a $75 fine and after four violations your license may be suspended. This entry was posted in Top Driver Blog and tagged Bad Driving Habits, Car Safety, Cell Phone Laws, Driving Practice, illinois, Road Safety, Safety Tips, top driver approved.